That’s weird, I could have sworn I’m physically incapable of getting myself out of bed before 9 on a weekend morning, unless there’s some kind of emergency. Yet here I am again, it’s only just gone 9 now and I’ve had an hour to admire my new yarn (stroke it, squeeze it, sniff it, press it to my cheek, yes I’m odd), add it to my Ravelry stash, admire it some more and eat breakfast. 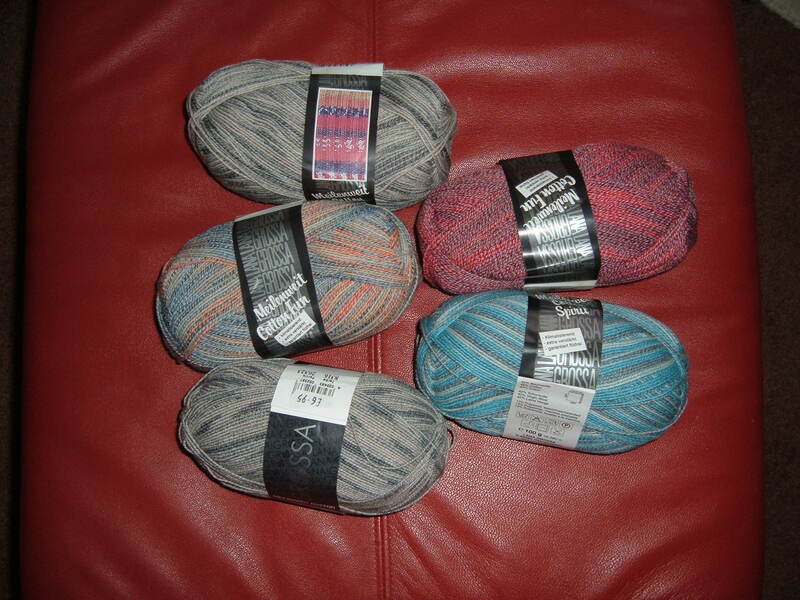 Yes, it’s another knitting related delivery in the post. I’ve promised A a pair of socks, to make up for the impulse buy. I also took a couple of photos of my rabbit, just because he’s cute. His official name is Twitch, because as a baby he was really nervous and jumpy. He’s not really like that any more, he’s more…lazy and dopey. Usually, he gets called whatever comes to mind (bunny, donkey-rabbit, dog-rabbit or dog-dog or just dog, doofus, you get the picture). He loves fuss and attention, and even now is laying at my feet, leaping up whenever I move in case I might want to stroke his nose. Poor old man is getting on a bit now, he’s 8 year old, which isn’t bad for a bunny with some serious health issues. He has had his teeth removed 3 (4?) times, as they were crooked and jagged and seriously damaged his mouth. 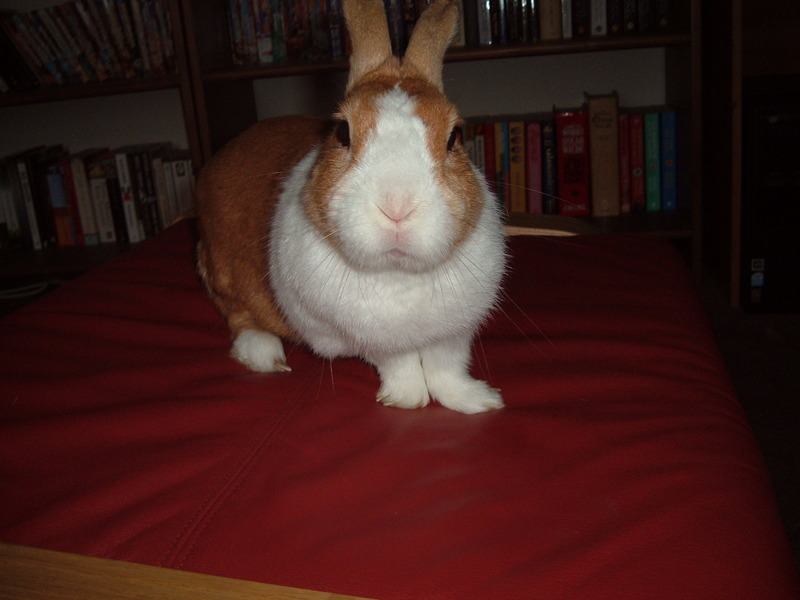 Unfortunately, rabbit teeth keep growing, but (touch wood) he’s been ok for a few years now. He’s also prone to what our vet diagnosed as ‘snuffles’, which seems to be a cold/flu/hay fever kind of thing where his nose and eyes stream constantly and when it gets bad he stops eating and can become seriously ill frighteningly fast. We have spent a huge amount of money on this rabbit in 8 years, but I don’t begrudge a penny of it because he repay it all in love and attention. If I get up in the night, ill or in pain, Bunny finds me within minutes and keeps me company. 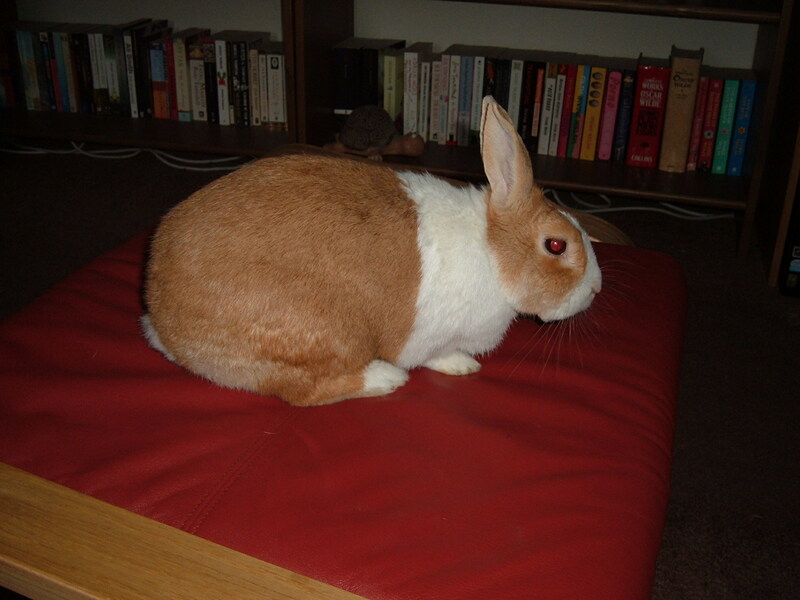 If A goes out for the evening, Bunny jumps up on the sofa or the chair in the library and cuddles up to me. He does, of course, have a few bad habits too. One is that he cannot seem to keep to weeing in his tray, and we occasionally find a puddle in a particular corner of the dining room. Luckily we have bare floorboards which are easily cleaned/disinfected. Secondly, he begs. For whatever we are eating, regardless of whether we are actually likely to share with him. We do very occasionally allow him the tiniest piece of chocolate, and he always gets a little bit of banana when I have one, but that’s it. Thirdly, and most embarrassingly, he ummm how do I put this? He humps. He has a cushion which is just his, and he gets carried away with it when he wants – it keeps him away from our furniture/legs/friends! Of course, he usually chooses to ‘perform’ when we have guests, which gets mixed reactions depending on who the guests are. Some tend to disapprove, get embarrassed, not comment. Plenty of other people just see the funny side and giggle at him. One friend in particular, a school teacher as well, has told all her friends and family, she thinks it’s so comical. So, Saturday, what am I doing today? As usual the morning is my own and I will start the washing (a sop to conscience) then settle down with knitting and audiobook. I’m trying to be disciplined, so I’ll put away the new pretty yarn until I’ve finished my lacy cardigan and baby sundress. Sigh. This entry was posted on June 21, 2008 at 9:42 am and is filed under knitting, Rabbit. You can follow any responses to this entry through the RSS 2.0 feed. You can leave a response, or trackback from your own site.